Beginning to see a pattern? I like mascara that give that "Are they you're natural lashes?!" effect. My first love was Benefit's They're Real. It was the first time I thought - finally, my lashes look how I want them to look. I never have a bad lash day (yes, that's a thing) with They're Real. It's the mascara I tell everyone to buy. Yes, I'm gushing, but give me a break, I'm in love! While I tell everyone about They're Real, YSL baby doll is like my dirty little secret. It's like the sophisticated big sister of They're Real. A slightly wetter formula, a smaller rubber brush that grabs lashes at the root and coats them in the blackest black. It's still the natural-false-lash effect, but the effect of baby doll is that little bit thicker at the base giving wonderful volume and can be carefully built up in the out corners for a winged lash look. Yes, it's €32.50 but by george is it beautiful. I'm sorry, but it even smells gorgeous! The packaging has that satisfying high-end *CLICK* when you close it (hands up who knows what I'm talking about??!) It's my special occasion, going out, I need to feel like a movie star mascara. If those two are a bit out of your price range, and I'll agree with you mascara is never something I'd spend a lot of money on, then I can't fault Maybelline's The Falsies. If you read Orla's blog MakeUpOverMind (which you should) she particularly loves this mascara. If I'm not mistaken she bought a second tube recently. Sure why wouldn't you, it's just shy of €12. I think if I never tried They're Real and YSL I'd be more in love. It's a good mascara, formula is a little drier than the other two but doesn't flake. Although I'm not the biggest fan of the brush. The spoon-brush, I think, is designed to fan out your lashes. It doesn't really work for my application technique which is a combination of zig-zag-at-the-base-and-twirl-upwards - maximum coverage, minimal clumping (no clumping in fact). It's just what you want on your average, Thursday-in-work/running-out-buy-milk makeup. No compromise on aesthetics, but subtle enough to make it look like your lashes are just awesome all the time. 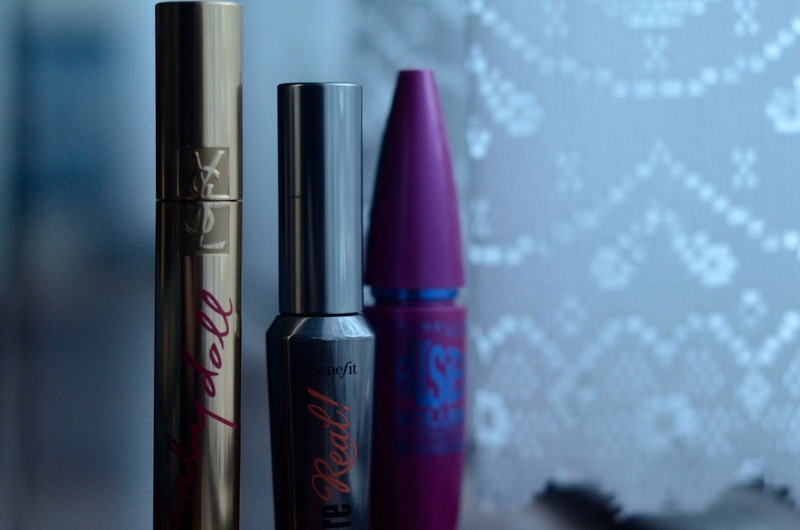 You really have to do something weirdly wrong to get any of these mascaras to clump or flake. They're coverage is flawless, and I speak as someone who needs every lash coated completely if they're to be seen at all. Not only that, they're all extremely long lasting even without technically waterproof - They're Real is my benchmark when it comes to testing make-up remover (many micellar solutions won't do it, but my Nima Mitt walks it). What are your favourite mascaras, or have you found The One? Did you put as much thought into it as I did?